Some of the cool places to unlock the badges include Berlin's Olympic Stadium, Big Chill House in London, and Darling Harbour in Sydney. (CNN) -- For the next month, millions of people around the world will stop what they're doing to watch the World Cup. Those who aren't lucky enough to be in South Africa will head to bars or pubs to watch the games while others will go to stadiums or watch on giant screens in public places like Copacabana Beach in Rio de Janeiro or Sydney's Darling Harbour. Regardless of where you watch, you'll probably want to let your friends know about it so they can join in the fun. To make it easier to share your World Cup passion, CNN has teamed up with the location based social networking service Foursquare on an innovative project for World Cup fans in the 32 competing nations. 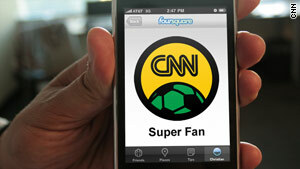 Fans will be eligible for two CNN badges on Foursquare. The "South Africa Explorer" badge is for people traveling to South Africa to attend the World Cup matches while the "Super Fan" badge is for fans who will be watching from pubs, bars and large viewing parties in the 31 other countries taking part in the tournament. Here's how it works: First, if you aren't already using Foursquare, sign up for an account at Foursquare.com. Then, go to Foursquare.com/CNN and follow CNN. You have to be a friend of CNN on Foursquare to earn the badges. If you're in South Africa for the World Cup, check in on Foursquare at stadiums, landmarks and viewing parties. If you're in one of the other 31 nations competing in the World Cup, check in from bars, pubs and public viewing parties while you watch World Cup matches. After three check-ins from specially designated venues, you'll earn one of the badges. And you will see tips from CNN's correspondents and staffers. For instance, if you check in from the official FIFA Fan Fest at Les Jardins du Trocadéro in Paris, you'll see this tip from CNN Senior European Correspondent Jim Bitterman: Official World Cup 2010 FIFA Fan Fest viewing spot. Watch the football matches with thousands of others with the Eiffel Tower as the backdrop. If you check in from the Westcliff Hotel in Johannesburg, you'll see this tip from CNN South Africa Correspondent Robyn Curnow: The bar has a wonderful view over the treetops of the suburbs, the Johannesburg skyline and, on a clear night, the blue rim of the Magaliesberg Mountains. Some of the tips will have links to CNN.com articles about that venue. You can earn the badges at more than 100 venues, including more than 40 in the United States and South Africa. And in the true spirit of Foursquare, we hope you'll add your own tips to the venues we've chosen. Since discovering cool venues on your own is part of the fun of using Foursquare, we won't give you a list of everywhere you can earn the CNN badges. But here are a few cool places to unlock the badges: Berlin's Olympic Stadium; Big Chill House, London; Darling Harbour, Sydney; Columbus Crew Stadium, Columbus, Ohio; Brewhouse Cafe, Atlanta; Nevada Smith's, New York. Where's your favorite place to watch the World Cup? Post a comment or send a tweet to @WorldCupCNN. For more World Cup coverage from CNN, watch CNN International TV, visit CNN.com/WorldCup and follow @WorldCupCNN on Twitter.